The extension might conflict with the regular Places Menu extension so make sure you disable it before using this extension (just in case). Also, if you've manually installed the extension, remove the files before installing the package in the WebUp8 PPA, most importantly /usr/local/share/glib-2.0/schemas/org.gnome.shell.extensions.places-menu-extended.gschema.xml - the PPA package installs this under /usr/share/glib-2.0/schemas because Launchpad doesn't allow files under /usr/local. 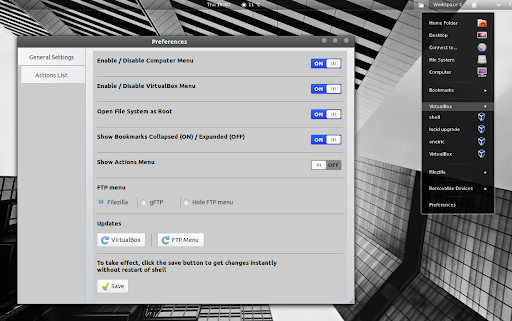 If you're not using Ubuntu, download Extended Places Menu GNOME Shell extension via GNOME Look - the archive includes step-by-step installation instructions. For Arch Linux, you can get the extension via AUR. Once installed, restart GNOME Shell (press ALT + F2 and enter "r" or log out and log back in) and enable the extension using GNOME Tweak Tool. To enable VirtualBox VMs, FTP, tweak other settings or define a custom actions list, select "Preferences" from the extension drop-down. Remember to click "Save" after making any changes or else the extension won't be updated! Update: if you use FileZilla with subfolders, see HERE how to get it working with Extended Places Menu.